Read below for more information on what is included, and the pros and cons of a contract. Salary or wages: Contracts will itemize the salary, wage, or commission that has been agreed upon. Schedule: In some cases, an employment contract will include the days and hours an employee is expected to work. Duration of employment: An employment contract will specify the length of time the employee agrees to work for the company. In some cases, this might be an ongoing period of time. In other cases, it might be an agreement set for a specific duration. Other times, a minimum duration is laid out, with the possibility of extending that period. General responsibilities: Contracts can list the various duties and tasks a worker will be expected to fulfill while employed. Confidentiality: Although you may have to sign a separate non-disclosure agreement, sometimes a contract might include a statement about confidentiality. Communications: If an employee's role involves handling social media, websites or email, a contract might include a point that the company retains ownership and control over all communications. Benefits: A contract should lay out all promised benefits, including, but not limited to, health insurance, 401k, vacation time, and any other perks that are part of the employment. Future competition: Sometimes a contract will include a non-compete agreement (also known as an NCC). This is an agreement stating that, upon leaving the company, the employee will not enter into jobs that will put him or her in competition with the company. 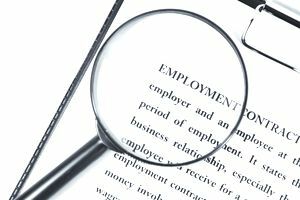 Often an employee will have to sign a separate NCC, but it also might be included in the employment contract. Other possible terms include an ownership agreement (stating that the employer owns any work-related materials produced by the employee), information on solving disputes at work, or qualifications on where the employee can work after leaving the company (this is a way to limit competition between related companies). A written contract is a great way to clearly define the job, your responsibilities, and your benefits. It prevents any confusion about the job. However, be sure to carefully read all elements of an employment contract before signing it. Make sure that you are comfortable with every part of the contract. If you break the contract, there might be legal consequences. Therefore, make sure you are able to uphold every part of the written agreement. For example, if the contract requires you to stay at the job for a minimum period, make sure you will be able to do this. Also, if the contract places limits on where you can work upon leaving the company, consider whether or not you are comfortable with this. Implied contracts can be inferred from actions, statements, or past employment history of the employer. An employee may have seen or recorded a history of promotions, raises, and annual reviews for themselves and their coworkers. During an interview, a potential employee may be told that the employee’s job is a long-term or permanent position in place unless they are fired for a good reason. While implied contracts are difficult to prove, they are binding. Employees can prove that an implied contract was established by pointing out actions, statements, policies, and practices of the company that led them to believe with reasonable cause that the promise would come to fruition.